The urge is to pass judgment on Gregg Berhalter's national team after four games when we'll only know the final verdict after four years. The USA got its first major test since he took over as national team coach on Tuesday night, and it escaped with a 1-1 tie against Chile. If Tuesday's game left you with the feeling that you've seen it all before, it was that you have -- the USA was again dominated by a superior opponent. And it was just what Berhalter was looking for. Chile pressed from the get-go and should have punished the USA in a hectic opening period. To the USA's credit, it still stuck to its game plan of trying to play through the Chileans' pressure, and it occasionally worked in the first half. USA needs to go to 2020 Copa America. Chile isn't the Chile of 2015 or 2016 when it won back-to-back Copa America titles. It failed to qualify for the 2018 World Cup, and the rebuilding job of embattled Colombian coach Reinaldo Rueda has a long way to go, as evidenced by how decisively Mexico beat La Roja, 3-1, on Friday night in San Diego. But Chile is still tougher than just about every team the USA will face in the next year. With the exception of Mexico, which beat Chile (3-1) and Paraguay (4-2) in Tata Martino's first two games as El Tri's coach, the USA will be favored to beat every Concacaf team it faces in the Gold Cup this summer or Nations League, which starts in September and will dominate the U.S. schedule for the rest of the next year. If there is a reason for U.S. Soccer to settle up with Conmebol and come up with an arrangement for FIFA to give a green light to get a full-strength U.S. team into the 2020 Copa America, the first four games of the Berhalter era showed it. The USA needs tougher competition if its young team is going to get better. Most players have been seen before. 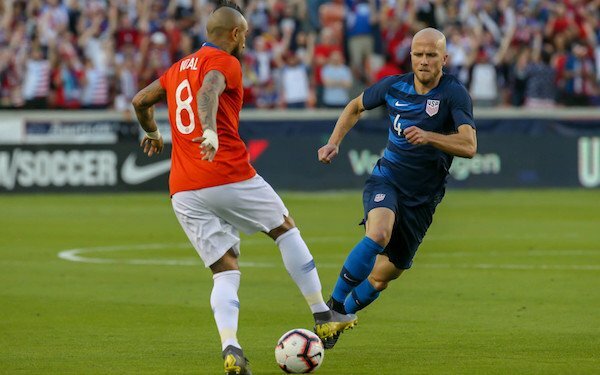 Berhalter made seven changes in the starting lineup from the team that beat Ecuador in Orlando. “Our goal was to evaluate as many people as possible in this camp," he said, "and we did that. That’s why we made seven changes to the lineup -- to get to see new faces." Most of the starters weren't actually new faces. Only two starters haven't been with the national team -- on and off -- since the days of Jurgen Klinsmann, which is going back three coaches now. Only three starters were on the field for the first time under Berhalter. By now, Berhalter has seen just about every player he wants to see in the short term with only a few exceptions: Jozy Altidore, Darlington Nagbe, Greg Garza and probably Brad Guzan. Later is better for USA. Down the road will be a chance to look at younger players from what is shaping up to be a very special group, by American standards, coming up through the ranks, beginning with Josh Sargent and Tim Weah whom Berhalter didn't want to bring in for the Ecuador and Chile games and have sit on the bench. It will take time for these players to mature, and most of that work will come at their clubs, away from the national team. That explains U.S. Soccer's deference to RB Leipzig, whose interest in recalling Tyler Adams after one game became all the more clear with the injuries to Weston McKennie and Christian Pulisic. The expansion of the 2022 World Cup from 32 to 48 teams seems inevitable, which will make it that much easier for the USA to qualify. The next World Cup isn't until November 2022, five months later than usual. World Cup qualifying won't end until March 2022, also much later than usual. All more time for the USA's young players to come of age. Berhalter will probably never have his full team together any time soon, and that's OK.
7 comments about "Time is on Gregg Berhalter's side". Samuel Levy, March 27, 2019 at 7:21 a.m.
Agree with the general spirit of the article. "By now, Berhalter has seen just about every player he wants to see in the short term with only a few exceptions: Jozy Altidore, Darlington Nagbe, Greg Garzaand probably Brad Guzan." I am hoping Mr. Kennedy (and thus Berhalter) mean Bill Hamid when he writes Brad Guzan?! Bob Ashpole replied, March 27, 2019 at 8:21 a.m. Taking "a long view" and thinking "time is on our side" are two different concepts. The latter is a crutch or excuse for ineffectiveness. Because, "time" passes the same for everyone. I am not as concerned with actual selections so much as I am concerned about the coach's vision of the game and how he wants to play which should underlay his selections. Bob Ashpole replied, March 27, 2019 at 8:22 a.m. I apologize. That was intended to be a comment rather than a reply. I must have hit the wrong button. David Gee, March 27, 2019 at 10:53 a.m. If Tim Ream remains first choice left back, Team USA is doomed. The only reason Ream holds a starting center back job at Fulham is that he is arguably the best of the worst defense in the EPL. If Berhalter's strategy was to give Ream enough rope to hang himself -- it worked. Egan Bailey replied, March 29, 2019 at 5:30 p.m. Agreed. As if we needed more evidence that Ream just isn't good enough. Brooks, Miazga, and Long would be a far better backline than what we've been subjected to. Long, at least, should have the speed of an LCB/LB hybrid that GGG likes. John Soares, March 27, 2019 at 11:01 a.m. I think he passes the test with very a good grade....so far. Most of these players have little experience, even less at this level. It will take a lot more time and games together to build a team. Consider the top teams in the world. Beyond individual ability. Most players have played dozens of games together. USA does not have that luxury....yet. beautiful game replied, March 31, 2019 at 2:42 p.m. Experience and playing together is not the issue here...it's player efficacy and ability to adapt in given situations...that's all that matters. Players who are able to adapt can play well together in a short period of times. Here's an example; Zardes, clueless on when and where to make off-ball runs, clueless in positioning , and mediocre in adapting to the game tempo, etc...he's had enough experience and delivers little to the table. So how is he a fit to the NT concept?